The above statement was made by Mohamed Osman Mohamud, a naturalized U.S. citizen from Somalia who planned to set off a car bomb during Portland’s Christmas tree lighting ceremony in Pioneer Courthouse Square last December. Mr. Mohamud made the statement to arresting detectives. Yet, the statement could very well explain the H.O.G. rally in the state of Oregon for 2011. It’s M.I.A.! 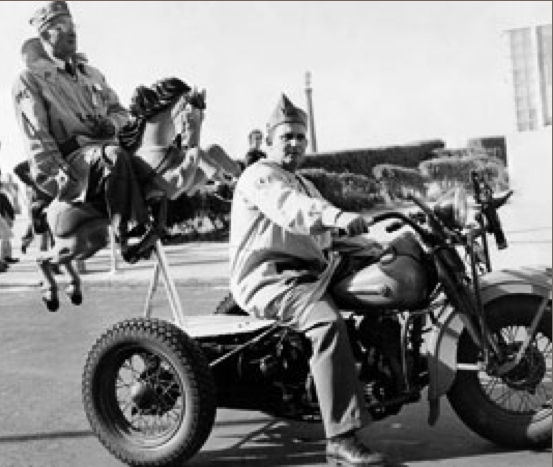 I’ve been planning out my riding season and I’ve seen a number of zany things in my travels, but nothing as wild as the veterans in the above photo of the Forty & Eight Club. So I went looking for event dates on the HOG members page and there is nothing listed on the site. I re-reviewed the latest print edition of H.O.G. (Edition: OO9 2011) which has a pull-out section dedicated to H.O.G. events in the U.S. and indeed it ignores Oregon state. Okay H.O.G. what’s the story? Being impatient I decided to call the national HOG-800 number and ask the question. After several minutes of press “#1-for-HD” and “#2-for-HOG” a nice lady put me on hold to check with her supervisor. She returned to the phone and told me that there is nothing planned as yet for Oregon – explains the lack of any information as I explained to her! More importantly I wanted to know if the state was being ignored because of my occasional less than flattering blog post on the motor company? Was it a decision made by National H.O.G. or was this a lack of initiative and action at the local level? I gave them an out on that last question and she stated that the local H.O.G. chapters had yet to provide any information to national. Classic shift of blame, but it might be true? Washington, Idaho and Nevada all have H.O.G. dates set! So, what’s up: Salem, Coos Bay, Sunset, Rose City, Southern Oregon, Pioneer, Central Oregon, and Twin Rivers H.O.G. chapters…?? ?